Press and hold the microphon-icon above to capture your voice. Use your keyboard to edit the captured text. «E.L.I.Z.A. Talking» is a project to explore the capabilities of client-side speech I/O in modern browsers. 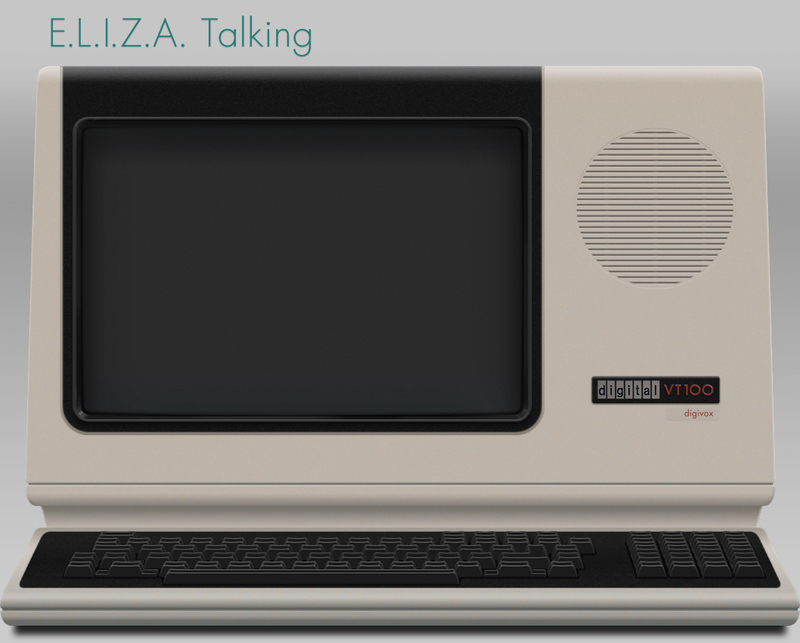 The project features Joseph Weizenbaum's famous ELIZA program, which demoed the thrills of a natural language conversation with a computer for the very first time. Joseph Weizenbaum (1923–2008) was an important pioneer in computer technologies and became later well known for his critique of technological progress. His program is presented here in the famous VT100 terminal, which was introduced in 1978 and became soon a universal standard. It provided many users their first ex­po­sure to interactive computing — an experience that might not have been far from what a real chat with a computer would mean today. All scripts by Norbert Landsteiner, mass:werk – media environments, www.masswerk.at. This page and embedded images © 2013 Norbert Landsteiner, mass:werk – media environments. Note: You may access an extended voice setup anywhere in a conversation by entering the Universal Expert Token [?]. In 1966 Joseph Weizenbaum described a ground-breaking natural language conversation program in his article “ELIZA – A Computer Program For the Study of Natural Language Communication Between Man and Machine” (in Communications of the ACM; Volume 9, Issue 1, January 1966: p 36-45) . The program, named after the ingenue in George Bernard Shaw's Pygmalion, featured various scripts, the most well known of which was «DOCTOR» and gave the parody of a nondirectional psychiatric interview (– “roughly as would certain psychotherapists (Rogerians)” – J.W.). By this set-up the program successfully side-stepped the problem of real-world knowledge, which is the most basic problem for any natural language conversation: Rather than answering any utterances with reference to the real world, it just echoed a paraphrase of the user-input transformed by a rather simple rule-set. «ELIZA» was originally implemented by Weizenbaum in SLIP (a list-programming language also created by him) and later ported to Lisp by Bernie Cosell. Ports to many other computer languages followed, «elizabot.js» being only one of them. In 1966 interactive computing (via TeleType) was a new thrill, available only at universities and big computing facilities. In 1978 that changed. The Digital Equipment Corporation (DEC) introduced the «VT100» terminal, which provided a both capable and affordable end-point to remote facilities and local machinery. The communication protocols used by the «VT100» soon became a universal standard for terminals, even now in use as any terminal-program mimics a «VT100» by default. Reason enough to present Weizenbaum's program in an embedding artwork representing a «VT100» terminal. «termlib.js» is used to provide an interactive interface with editing capabilities and Peter Hull's «VT323»-font was chosen to populate the virtual screen. The font is not exactly the one used by the VT100, but modelled after the type appearing on the screen of a VT320-terminal, one of VT100's later siblings. The artwork was hand-made from scratch using Photoshop (no rendering involved). Please note that there never was a model “digivox” or any other VT100-terminal with a front-speaker. Adding audio-output other than a beep is purely fictional, but suits the purpose of mending the newness of technologies in consecutive eras. UX-Note: Call the URL with parameter “?mobile=true” to emulate a mobile device accessing this page. P.S. : You may access a transcript of your session by entering “show transcript“, or “show session transcript“, or just “transcript“. Copyright 2013 Norbert Landsteiner, mass:werk – media environments. All rights reserved. No copying, no unauthorized providing or hosting.